The Tribal Council would like to invite you to attend the Final Phase in this 12+ year long journey! This punitive phase will determine the monetary damages caused by Mr. Stein. 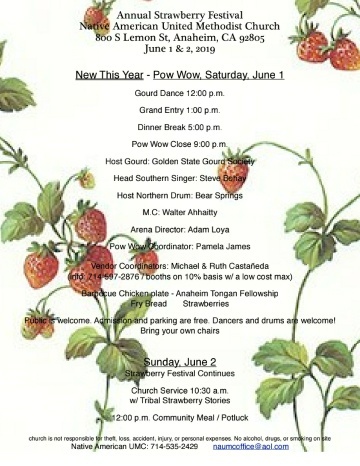 The Native American United Methodist Church presents the Gourd Dance and Pow Wow. All gourd dancers and community members welcome! 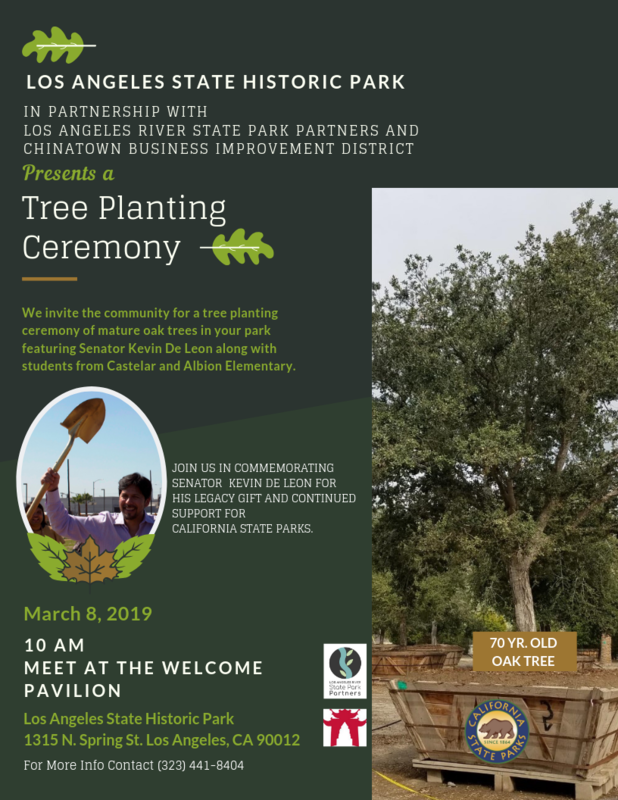 legacy gift and continued support for California State Parks. and Pow Wow. Admission and parking are free. Dancers and drums are welcome! This is a private gathering and therefore, closed to the public. invited by the Tribal Council. Time: Doors open at 12:00 PM. Take the exit for Ball Rd. Go west on Ball Rd. Turn Right onto S Anaheim Blvd. Turn Left onto W Valencia Ave. Turn Right onto S Lemon St.
Take the exit for Harbor Blvd. Go north on Harbor Blvd. Bear right and then turn right onto W South St.
Come find out the latest information on the court case and what it means for the future of the tribe. provided, as well as, cups, plates, napkins, forks and spoons. 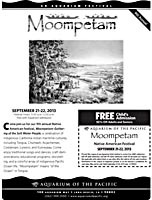 If you have any questions, contact Tribal Council Chairwoman Sandonne Goad at 951-807-0479. Thank you to everyone in the Tribe that has supported and prayed for our Nation and Tribal Council. We claim a complete and total victory. All Drummers and Dancers Welcome! 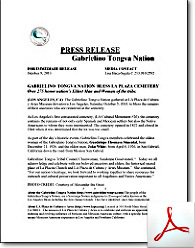 The next General Meeting of the Gabrielino Tongva Nation will be in El Monte. Come join us as we will be swearing in our newest Tribal Councilman Reuben Dominguez, II. Chairwoman Sandonne Goad if you would like to also bring food or refreshments. Take exit 28 for Santa Anita Ave. Turn Left at Sally Tanner Dr./Bodger St. follow around to parking lot. Turn Right at Concert St. Turn Right at Tyler Ave. Turn Right at Sally Tanner Dr./Bodger St. follow around to parking lot. Fishing day has been cancelled due to Fisherman's Retreat changing and adding costs. Sorry for the inconvenience, we look forward to next years fishing day. Take the exit for Ball Rd. Go west on Ball Rd. Turn Right onto S Anaheim Blvd. Turn Left onto W Valencia Ave. Turn Right onto S Lemon St.
Take the exit for Harbor Blvd. Go north on Harbor Blvd. Bear right and then turn right onto W South St. Turn right onto S Lemon St. 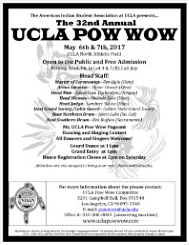 Chairwoman Sandonne Goad at 951-807-0479.
on Saturday, April 14, 2018, at the Autry Museum Of The American West. on Sunday, January 21st, 2018, at the La Plaza de Cultura y Artes. Merge onto W Aliso St. Turn Left onto Arcadia St. There were 193 Citizens registered to vote and 130 votes cast. and the Election Board for all of their hard work. on Saturday, September 16, 2017, at the Autry Museum Of The American West. Chairwoman Sandonne Goad if you would like to also bring refreshments. Doors will open at 12:00 PM. Enjoy the world premiere of Fairly Traceable at the Autry Museum. Thursdays, Fridays, and Saturdays: 8:00 p.m.
Saturdays and Sundays: 2:00 p.m.
For reservations and more information please follow the link below. The Tribal Council would like to invite you to join us at the upcoming General Meeting. No Court on January 17th. Please check back for updates. on Saturday, December 10th, 2016, at 10:00 AM, at the Grace T. Black Auditorium in El Monte. Please see the Reminder Notice for what we will be doing at this event. We anticipate celebrating our court win and a possible Swearing In Ceremony for our Citizens. again defeat Mr. Stein in a Court of Law. - There are only pay for parking areas around the Court House. - Turn off your cell phones and no talking when the Judge is in the room. - If you have to leave or are returning, please do so quietly. their care if you plan on attending the court proceedings. fees or wasted time, money, and gas. Read our Motion For Summary Adjudication against Stein. Mark you calendars for these exciting Pow Wows coming up this year. The gathering is to be held on Saturday, March 19th, 2016. Turn Left at Sally Tanner Dr./Bodger St. Turn Right at Sally Tanner Dr./Bodger St.
Congratulations to the following candidates! Our next General Meeting will be held at La Plaza in Los Angeles. Refreshments will be provided outside on the patio under the awning. from the event, if anyone would like to ride the Metrolink. November 2nd Court date postponed until May 31st. Read the courts filing below. will be provided to receive UCLA Course Credit. PROPOSED CONSTITUTIONAL AMENDMENT VOTING: Sunday, May 24, 2015. Polling starts at 8:00 AM and ends at 1:00 PM. The gathering is to be held on Sunday, May 24th, 2015. The gathering is to be held on Sunday, February 15, 2015.
start at 11:30 AM, and the meeting will begin at 12:30 PM. Take the Glassell St exit. Go north on Glassell St. Turn Left on Almond Ave. Turn Right on Olive St.
Go east on Chapman Ave.
look forward to speaking with all of you at our Nation’s Winter Gathering. Our next General Meeting will be held at Grace T. Black Auditorium in El Monte. 111 N. Hill St., Los Angeles, California. Parking: $10-$15. develop the drive to pursue a college education. The conference is free, however requires an RSVP to attend. Free/Reduced Sport fishing licenses to people who qualify. Feel free to read the court's finding below. Very special thank you to everyone that attended our fall meeting. good fortune it will bring to thousands of families in the Los Angeles Basin. Festival Hours: 9:00 a.m.–5:00 p.m.
Children Free with Aquarium admission. Download the PDF below for more information. Our next General Meeting will be held at the Mystic Canyon Community. Location: Mystic Canyon Community Bld. 1. Take the 91 to the 71 North. 4. Turn Left onto Shady View Dr. Parking will be on the right. 1. Take the 60 to the 71 South. Congratulations to our logo contest winner Lynsay White. Thank you everyone that participated in this contest. kept faith that we would prevail. Thank you. tribe present to represent the Gabrielino Tongva Nation. sporting face paint with the traditional Tongva tribal colors, red, white, & black. Press Enterprise Sunday edition for news of the event. Logo Contest Announcement: Enter by October 15th! stationary, tribal products, and website. Contest winners will also be acknowledged on our Tribal Website. the courts for the last 6 years. we can enjoy good food and tribal camaraderie. Polls open at 8a., Close at 1p. LA City/County Native American Indian Commission Meeting at 7pm.